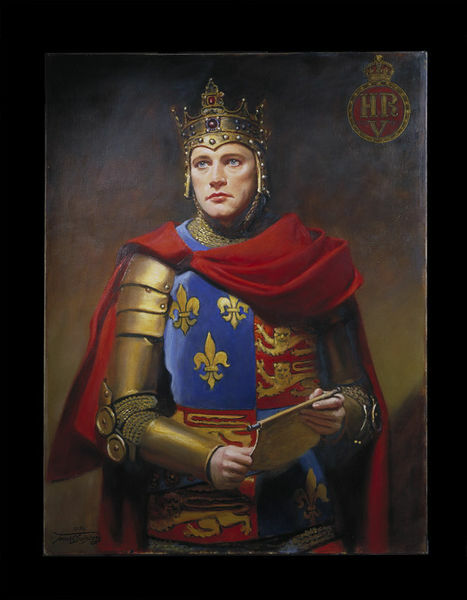 Oil painting of Richard Burton as Henry V, by Frank Owen Salisbury, ca. 1956. Certain Shakespearean characters have an instantly recognised image, but few have an image which corresponds to the way that character is presented on the contemporary stage. The popular idea of Hamlet is of a young man in black doublet and hose, but 21st century Hamlets are unlikely to appear in tights. The costuming of Henry V has, however, remained remarkably unchanged through the 19th, 20th and 21st centuries. Though a 21st century Henry may appear in battle fatigues instead of armour, the character is more commonly dressed in tabard, chained mail and crowned helmet. Charles Kean in the 19th century, Laurence Olivier in the mid-20th century and the Royal Shakespeare Company's Henrys of the 1980s and 1990s, Kenneth Branagh and Iain Glen, have all worn similar costumes. In Frank Salisbury's portrait Richard Burton is the archetypal noble Henry. Burton played the role twice, first at Stratford in 1951, then at the Old Vic in 1955. The painting shows the Old Vic production, which was designed by Audrey Cruddas and directed by Michael Benthall. Burton's performance was acclaimed and he was hailed as the natural successor to Olivier. However the 1955-56 Old Vic season was his last on the London stage. Thereafter he concentrated on his film career and his only other theatre role in Britain was Dr Faustus at the Oxford Playhouse in 1966. Frank Owen Salisbury (1874-1962) was a painter of historical subjects and a portrait artist. His sitters included members of the Royal Family and public figures in Britain and the United States. 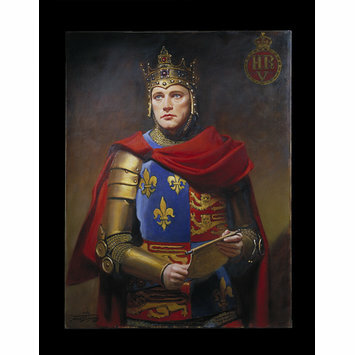 Oil painting of Richard Burton in the title role of Henry V at the Old Vic, London, 1955-56. He wears a crowned helmet and plate armour with a heraldic tabard and a red cloak, and holds a scroll. Richard Burton (1925-84) was born in the mining village of Pontrhydyfen, the twelfth of 13 children. His family name was Jenkins, but he became famous under the adopted surname of his teacher and mentor Philip Burton. After his celebrated seasons at the Old Vic, he left Britain and made his career in Hollywood.